✔One Key Transform With one key transform, it turns into a flying egg with wings. ✔Altitude Hold With the push of a button, set your drone to hover at your preferred altitude. This makes controlling the drone much easier and stabilizes the camera for aerial photography and videography. ✔CF Mode Once activated, the pilot is able to fly the drone to any location without the need to worry about which direction the drone is facing. ✔3D Flips Rolls Perform extreme stunts, flips, and tricks with simple joystick combos including Up/Down, Left/Right, Forward/Backward, 360°flips, and 360°rolls. ✔2.4Ghz 6-AXIS GYRO Technology 2.4G technology makes it possible for several models being played at the same time without interference; Built-in 6 axis gyro helps to hold the attitude and position of fuselage which making the video shooting and photograph more stability. ✔Portable and Lightweight Pocket sized egg form without exposed blades to prevent damage during transportation, making it easy to carry around. Very small drone size and perfect for indoor drone flying. Perform extreme stunts, flips, and tricks with simple joystick combos including Up/Down, Left/Right, Forward/Backward, 360°flips, and 360°rolls. 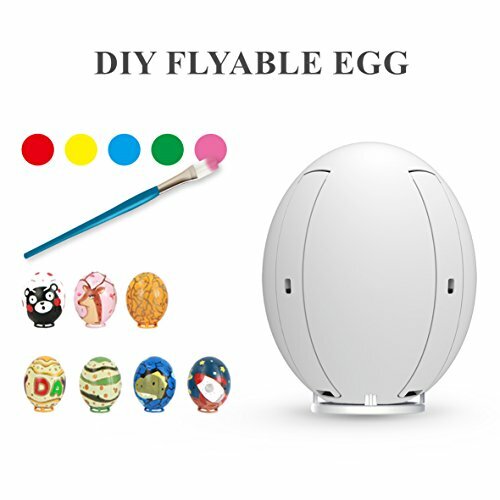 Special Flying Egg Design fits both teenagers and adults. You can play fun with your kids. Painting your works and flying to show it. A PERFECT GIFT FOR FESTIVAL AND BIRTHDAY!